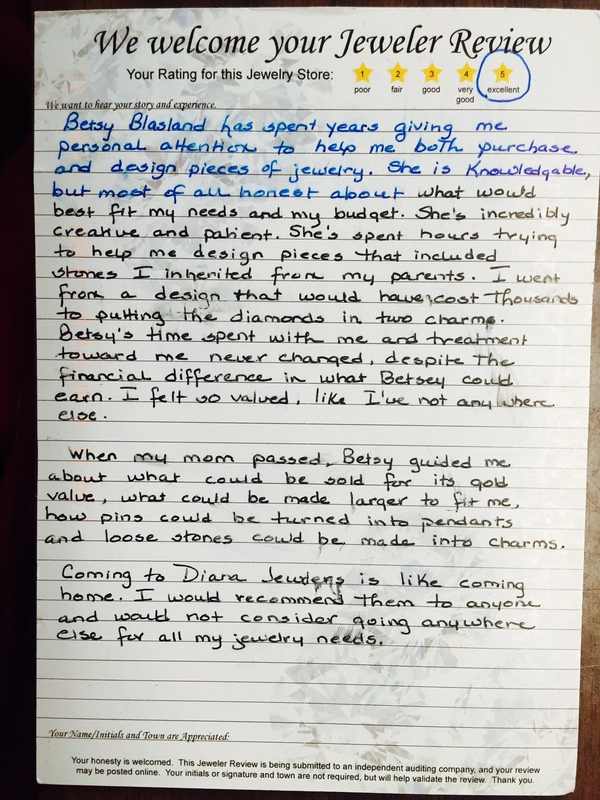 Betsy Blasland has spent years giving me personal attention to help me both purchase and design pieces of jewelry. She is knowledgeable, but most of all honest about what would best fit my needs and my budget. She's incredibly creative and patient. She's spent hours trying to help me design pieces that included stones I inherited from my parents. I went from a design that would have cost thousands to putting the diamonds in two charms. 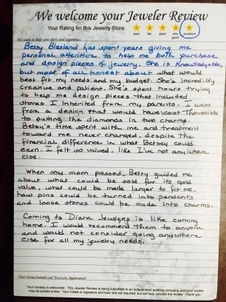 Betsy's time spent with me and treatment towards me never changed, despite the financial difference in what Betsy could earn. I felt so valued, like I've not anywhere else. When my Mom passed away, Betsy guided me about what could be sold for its gold value, what could be made larger to fit me, how pins could be turned into pendants and loose stones could be made into charms. Coming to Diana Jewelers is like coming home. I would recommend them to anyone and would not consider going anywhere else for all my jewelry needs.